A romance set on a ramshackle boat in Africa of 1914, The African Queen is a classic tale of attraction slowly developing between opposites under extreme stress. Humphrey Bogart finally won a deserved and long-overdue Best Actor Academy Award, while Katharine Hepburn and director John Huston were nominated. In German East Africa, the rumblings of an outbreak of a great war in Europe is bad news. The British Reverend Sayer (Robert Morley) and his sister Rosie (Katharine Hepburn) have established a mission at a tribal village deep in the jungle. Their only contact with the outside world is through the uncouth Canadian Charlie Allnut (Bogart), who captains the African Queen, an ageing river supply boat. Allnut stops by the mission every few weeks to deliver mail and supplies. An agitated German army unit soon arrives, torches the village, rounds up the natives, and hastens the demise of the ailing Reverend. Abandoned in the village ruins, Rosie has no choice but to team up with Charlie to find a safe shore. The prim and proper Rosie and the unkempt Charlie awkwardly navigate around each other in the confined quarters of the African Queen, and Rosie increases the tension by suggesting that they travel down a dangerous stretch of river and use their on-board explosives to ram and destroy a large German gunship patrolling a strategic lake. But slowly, Rosie and Charlie find the common warmth below their incompatible exteriors, fall in love, and jointly continue their implausible mission. 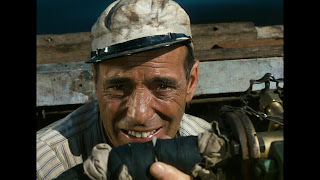 Bogart dominates the film with his sweaty, dirty, but resourceful performance as Charlie Allnut. Not quite as self-centred as many of Bogart's other characters but still looking mainly after his self-interest, Bogart plays Allnut as none-too-sophisticated but world-weary enough to know which direction his boat needs to point in. Allnut is repeatedly manipulated by Rosie into doing what she believes is right, but he always eventually comes around to her way of thinking, several hours or days later. Katharine Hepburn's Rosie puts on an aura of cold colonial detachment, but it does not take her long to reveal a calculating mischievous personality, followed by a willingness to passionately surrender to Allnut's charms. Rosie is always several steps ahead of Charlie in her thinking and plotting, but she is also patient enough to allow him to catch up, knowing that she needs him in more ways than one. 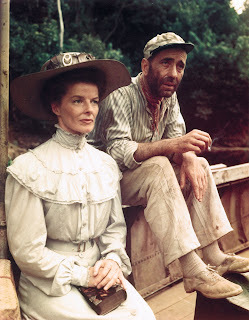 The third star of the movie is the African Queen herself, a river supply boat beautiful in her ugliness. A perfect companion to Allnut, the African Queen is a direct reflection of his personality: outwardly dishevelled but hiding a large reservoir of inventiveness, and capable, when kicked and pushed, to achieve the unexpected. John Huston directed most of The African Queen on location in Africa, a risky proposition in 1951, and one of the earliest major productions to venture outside the safety of the Hollywood studios. Huston masterfully confines most of the action on-board Allnut's boat without allowing claustrophobia to creep in. The boat chugs along, hosting the drama unfolding between Charlie and Rosie, navigating through and around the dangers posed by the river, and doggedly making its way to a date with destiny, and movie immortality.